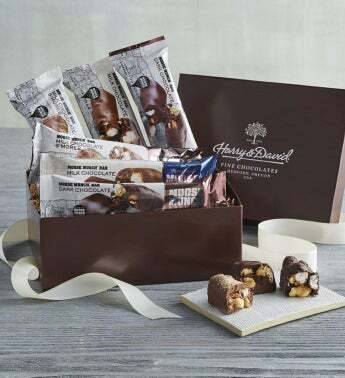 Our Moose Munch® Bar Gift Box includes a half-dozen chocolate dessert bars inspired by our classic caramel corn. Each Moose Munch® Bar is a sumptuous blend of rich chocolate, buttery popcorn, and fluffy marshmallow. Packaged in a gift box, these carefully crafted treats make a sweet surprise. Includes three flavors to savor and enjoy: milk chocolate, dark chocolate, and s'mores.